Dragonlance was originally envisioned with a very specific philosophy which became a standard against which all character actions and plot structures -- both in the novels and the games -- were to follow. 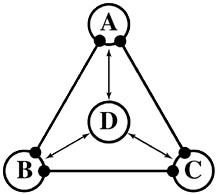 This philosophy is best pictured as a triangle of three points equidistant from each other witha fourth point suspended in the middle of the other three. While the outter points are seen as somewhat immutable and stationary, the center point constantly swings between the other three. 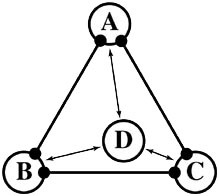 It is the motion of point D between points A, B, and C that gives motion and life to the structure. Point A, of course, is the standard fantasy plot while point B is everyone reading the books, and point D is all the money traveling from point B to point C, the authors' bank account. How to Host a Mystery!